We are very proud this week about the launch of our new line of Sopes and Huaraches. They are delicious and Connie and Diana are already working on awesome recipes that several magazines have asked us to submit. If you have any ideas, please, please, please, send them to us. Several Chefs in America, like Rick Bayless, and in Mexico use huaraches to put chorizo on top and make a delicious dish. If you prefer to make your own huaraches, here is a good recipe: http://www.rickbayless.com/recipe/view?recipeID=115. But of course if you want something as good as home-made, without going through all that trouble, just ask your local gourmet store to supply you with our huaraches and sopes. Our line is really taking shape. 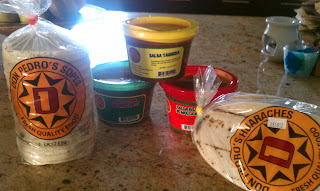 We have an award winning salsa, a chorizo to die for and now the sopes and huaraches to put them on. Everything you need for an excellent authentic meal.